The prospect of making hollandaise instills a bit of fear in home cooks, culinary students and even professional chefs, but it doesn't have to. You have two things to worry about with hollandaise: the eggs curdling and the emulsification breaking. As long as you keep the sauce under 160 degrees Fahrenheit, the eggs won't curdle. But, if you add the butter too fast, let the hollandaise get too hot or keep it warm for too long, it separates. 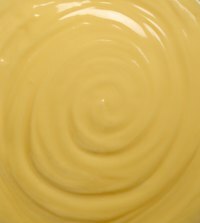 You can relieve your sauce-induced stress and keep hollandaise warm without separating by controlling the temperature or adding an emulsifier. Place a stainless-steel saute or frying pan on the stove and pour about 1/2 inch of water in it. Set the heat on the stove to medium. Use a pan large enough to set a smaller saucepan inside it. Transfer the hollandaise to a heavy-bottomed saucepan and set it inside the pan of water on the stove. The saucepan and frying pan act like a double boiler and keep the temperature of the hollandaise stable. Attach a deep-fry thermometer to the saucepan. You can substitute a digital instant-read thermometer for a deep-fry thermometer if desired. Heat the hollandaise to 100 F. If the hollandaise breaks while heating, dip your fingers in a glass of ice water and flick the cold water into the sauce while whisking vigorously. Continue whisking until the sauce emulsifies. Adjust the heat on the stove as needed to hold the hollandaise at 100 F. Hold the hollandaise at 100 F until you serve it. Fill a saucepan about 3/4 full of hot water and place it on the stove. Set the heat to medium-low. Place a stainless-steel mixing bowl on the saucepan to make a double boiler. Beat 2 egg yolks in the mixing bowl until frothy for every 1 cup of hollandaise you want to make. Whisk in a pinch of soy lecithin, or 1/4 to 1/2 teaspoon, for every 2 egg yolks you used. Add about 4 or 5 tablespoons of melted butter for every 2 egg yolks, whisking constantly. Add a pinch of cayenne pepper and lemon juice to taste. Hold the mixture warm up to 160 F.
You will attain a more stable emulsion if you mix the hollandaise in a food processor or blender instead of whisking it by hand. Simply add 130 F butter and a squeeze of lemon juice to pasteurized egg yolks and blend until the sauce emulsifies. Make hollandaise sauce at the last minute, if possible. The longer you hold hollandaise warm, the greater the chances of it breaking. You can find soy lecithin at health-food stores. You can add soy lecithin to the hollandaise sauce after you make it, if desired. The Kitchn: Why Did My Sauce Break? Modernist Cooking Made Easy: Soy Lecithin; What is Soy Lecithin? How Do I Keep Soup From Curdling?